Dubai, UAE, October 16, 2018: Roda Hotels and Resorts had two wins at the recent GCC Best Employer Brands awards to honour outstanding professionals and institutions across industries in the region. Roda Al Bustan Dubai Airport Hotel and Roda Amwaj Suites Jumeirah Beach Residence were acknowledged as regional leaders in hospitality at an event held in Dubai to announce and commemorate this year's winners. 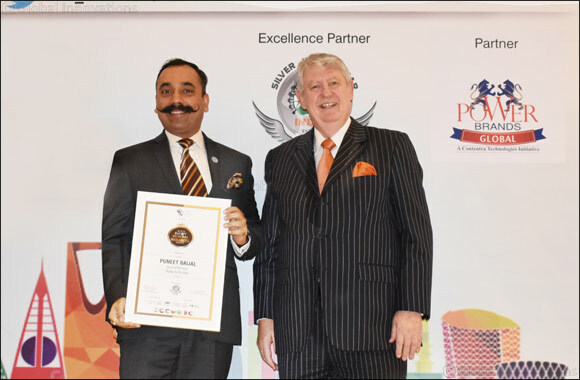 Roda Al Bustan's general manager, Puneet Baijal, was accorded the title of ‘GCC's Best General Manager – Hospitality' in recognition of steadfast commitment to guest satisfaction. The iconic 5-star hotel has 279 rooms and seven award-winning restaurants at an enviable location close to Dubai Airport. Concurrently, Roda Amwaj Suites won the award in the ‘GCC's Best Employer' category for high levels of employee satisfaction. Located in the heart of Jumeriah Beach Residence, the property offers 340 fully-serviced apartments in sizes ranging from 1-bedroom to duplex lofts and penthouses. “At Roda Hotels and Resorts, we are committed to providing all our guests with warm and winning Arabian hospitality in contemporary settings, and our people are at the forefront of leading and directing these efforts. The recognition accorded to Roda Amwaj Suites as a great employer emphasises the tremendous value we place on our people” she added. The prestigious Best Employer Brand Awards are hosted jointly by Employer Branding Institute, World HRD Congress, and Stars of the Industry Group, and recognise best practices and outstanding professionalism in several geographical areas. This year's GCC edition accounted for winners across Oman, Kuwait, Bahrain, Saudi Arabia and the United Arab Emirates, who were each presented with citations at the event held at The Address Boulevard on 3 October.